Welcome to the final installment of this week's special feature on author Sandra McDonald and her Outback Stars trilogy. I'm excited to present an exclusive interview with the author. Read on to learn more about her creative process, anti-submarine warfare school, and Bollywood movies. The Galaxy Express: THE OUTBACK STARS is a complex and richly detailed journey through time, space, and love. I imagine its development was equally labyrinthine. Please describe the evolution of the trilogy from story conception to publication. Sandra McDonald: I wish I could say there was a grand plan, intricately designed, that guided the three books like the stars guide ships across the seas. Unfortunately, it's pretty much the opposite! Book one was written as a stand-alone, book two as a sequel, and then book three to resolve the quasi-cliffhanger of book two. At times wrestling the characters and plot has been like wrestling with an octopus – once I pin down one arm, another flings itself into the air. It's been exhilarating and exhausting. I don't recommend it, but at the same time, the sea is in my blood, and so I go back to it time and time again. TGE: Approximately how much time, total, did you spend on research? What were some of your favorite discoveries? SM: I don't specifically track research hours, but I'd imagine it was hundreds of hours spent between books, websites, and documentaries. I've had "The Fatal Shore" by Robert Hughes on my bookshelf for years and that's a great, classic resource for anyone interested in the history of Australia. "The Girl from Botany Bay" by Carolly Erickson really opened my eyes to the horrors convict women faced on their way to the colony, and the hardships they endured after landing. The National Library of Australia has an amazing digital collection that I used to read old newspapers and look at fashions, places, and people. TGE: Was there any particular inspiration for the romance between Terry Myell and Jodenny Scott? SM: I first started thinking about the book while I was an officer in the Navy – a single female officer surrounded by a lot of handsome enlisted sailors. How tempting! But fraternization was a big issue and could lead to court martial, as it did for a classmate of mine from anti-submarine warfare school. I knew that I wanted to make that a central part of the story – the tension between what the heart wants, and what military regulations insist on. TGE: Were there any challenges/obstacles regarding integrating a romance with the military and indigenous Australian mythology elements? SM: Integrating a romance with the military was easy. Integrating Australian mythology itself is the harder part. The Indigenous people of Australia have many different myths and customs that often compete with one another, and I didn't want to offend any one group by using only the details of another. So that was a balancing act. SM: David Anthony Durham is doing great work with his Acacia series, and I'm excited to see N.K. Jemisin's "The Hundred Thousand Kingdoms" coming out soon – I read that in workshop form, and it's very powerful. The Australian writer, Maxine McArthur, has a Japanese sf mystery with a strong female protagonist – "Less Than Human" is the book, and it won the Aurealis award. Charles Coleman Finlay has some short fiction with the Russian perspective – "The Political Officer" was the first, and "The Political Prisoner" is up for a Hugo right now. These are my favorites right now, and I'm on the lookout for more . . .
TGE: If you could travel back in time to your early days of writing, what advice would you give yourself? SM: My original goal was to be a screenwriter, and that's still a big interest. If I could tell my 18 year old self anything, it would be to start writing novels earlier! And to write lots of short fiction, which is one of my favorite forms. TGE: In light of your attendance at various workshops, e.g., Viable Paradise, what has been the most satisfying about those experiences? The most challenging? SM: A satisfying workshop challenges your worldview on what good writing is, and opens your eyes to the world of writing around you. Notice that I said "satisfying," and not necessarily "happy" or "enjoyable." I spent a lot of time at Viable Paradise feeling inadequate as a writer. But I learned a lot, and found in myself the steely determination (or darn pigheadedness) to just keep writing, no matter what. The best aspect of a workshop is, of course, the teachers – not the paid teachers, necessarily, not just the people who are supposed to instruct you, but also your peers and classmates. These can be the worst, too. And so we learn from everyone. TGE: Let’s say I’m going to Australia tomorrow. What would you suggest as far as a travel itinerary? SM: If you're going to Australia tomorrow, I'm going with you! Because I've only been to Sydney and the Blue Mountains. As long as we're dreaming, let's include Sydney, Uluru (Ayer's Rock), Kakadu National Forest, the Great Barrier Reef, Melbourne and Tasmania. But not all in the same day. And then we'll really start to travel – across the outback! TGE: Is there any news you’d like to share about your current or future works? SM: Keep an eye out next spring for my collection "Diana Comet and Other Stories," from Lethe Press. It's a Bollypunk gender-bending mashup that's been a lot of fun to write, and which is about as far from military science fiction as you can get. If you like Bollywood movies, historical fantasy, lovesick cowboys, zombie authors and gay firefighters, this might be the book for you. The lead story, Diana Comet, appeared in Strange Horizons earlier this year. I'll have it in hand at Wiscon, and hope to see you there. What a terrific glimpse into your universe, Ms. McDonald. Thanks for your time, and for your art! Now, who’s up for a free paperback copy of THE OUTBACK STARS? To enter, please leave a comment for this post (giveaway limited to U.S. residents). The deadline is noon on Sunday, July 26, 2009. 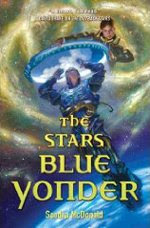 Also, enter here for a chance to win THE STARS BLUE YONDER from Tor. Finally, head on over to Fantasy Debut for a review of same.